An alluring bonhomie radiated from the gold lot last Saturday. From the grand fellowship of good friends and family to the sweet aroma of smoked meat and craft beer, the day was filled with ardent excitement of another game day. For me, the fervor started the Thursday leading up to game day. Evan Peraza from Mountaineer Sports Marketing contacted me to tell me that I had been selected for the season ticket holder spotlight for the WVU vs. Delaware State game. As such, Dave and I would be spotlighted during the game, receive on-field passes for pre-game and half-time, and get a care package with all sorts of goodies. On top of that, we had family and friends coming in from out of state. First, there was Bill Brash, of Freehold, NJ. Bill used to tailgate with us every home game, but now he only comes once or twice a season. We met up with Bill on Friday for lunch at the Mountainstate Brewing Co., and then headed to happy hour at our favorite hangout, Mario’s Fishbowl. My sister, Missy, and brother-in-law, Rick, joined us a couple hours later, followed by my friends Suzi and Chris, of Hudson, Ohio, and Pete, of Birmingham, UK. Suzi and Chris brought Pete with them last year for his first American tailgate, and he wanted to come again this year. We dubbed him the British ambassador of the gold lot. This was their first trip to the Fishbowl, so Pete joined in the tradition of adding to the wallpaper of personalized notes. As usual, Bill had come prepared to serve up pure deliciousness. The air surrounding our tailgate was spiced with the sweet, smoky smell of chicken and steak. The main entrée was a heavenly chipotle beef that Bill had been marinating since the Thursday prior. As with every tailgate, we chewed the fat and made the most of our pregame festivities. My friend Pam Riddell, of Allentown, Pa., also came with her husband, Gary. Pam had not been back to Morgantown for 20 years, so she was enjoying showing Gary her old stomping grounds and regaling him with stories of her college antics. Even though Pam and I went to WVU at the same time, we didn’t meet until last fall. We met at a healthcare marketing communications leadership forum in Cape Cod. She noticed my flying WV clutch and the rest is history. Dave and I had to cut our tailgating short so we could meet Evan an hour before the game. They filmed us on the field waving to the camera, and then showed the video snippet during the 3rd quarter of the game. After our taping, Dave hurried back to the tailgate while I stuck around to watch the team practice and get a few pics. 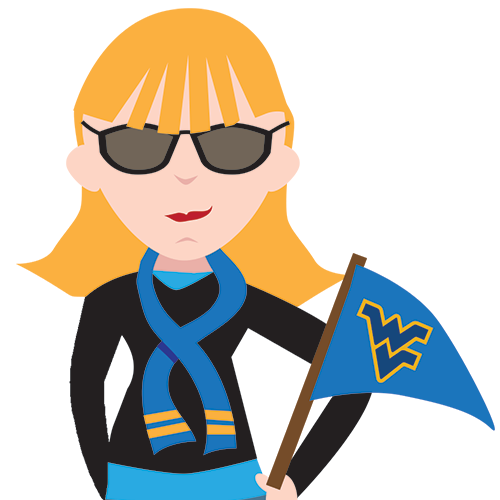 I also cheered on the Mountaineers while they rushed onto the field. All in all, not a bad way to spend my Saturday. And, the Mountaineers stung those Hornets 59-16.